Yoo Byung Jae Drawing Contest With Extravagant Prize By YG Ent. -YG Entertainment make a competition for Yoo Byung Jae`s face competition. They will prize the winner with Yoo Byung Jae`s ticket for Comedy Show, iPad Pro, Nintendo Switch, and the winner`s drawing will be exhibited in the auditorium of the comedy shows. The participatns have to upload their draw on Instagram at 3rd April. And they have to using hastag "Yoo Byung Jae Drawing Contest" and "Jokes of B". The theme of the drawing is "I Draw Yoo Byung Jae`s Face". Yoo Byung Jae`s comedy will be held at 27-29th April 2018 in BLue Square Eye Market Hall. The shows is limited for ages more than 19th years old because Byung Jae`s comedy show will be showing more dark comedy. Are you interested in this contest? 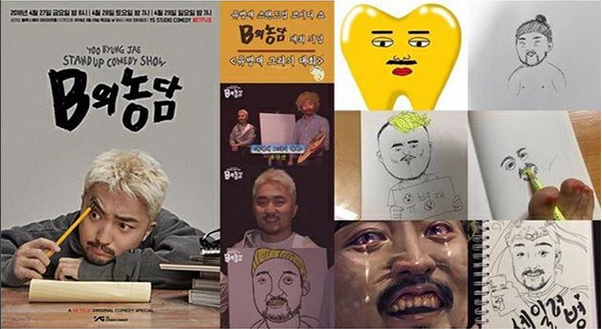 Yoo Byung Jae Drawing Contest With Extravagant Prize By YG Ent.